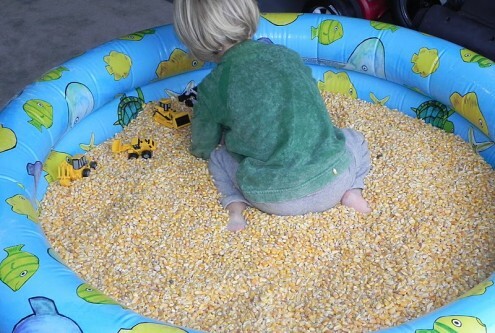 You know how you feel when you go to one of those bounce house places? Loud music, lots of colors, and total overstimulation? Do those places make you want to hide in a dark closet most days? 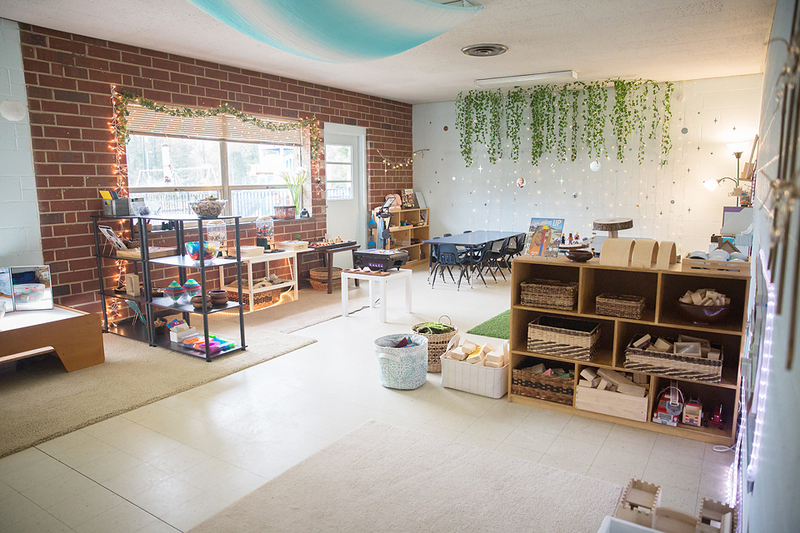 Have you ever wondered why most classrooms look like that? 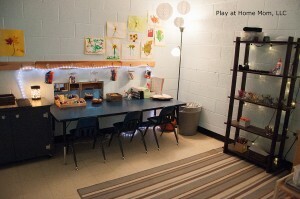 How is that conducive to a calm, inspiring, engaging learning environment? I’ve started teaching again. 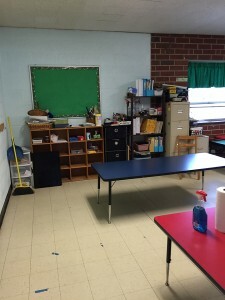 When I walked into my classroom before the year started, it was all I could do to keep from running for the door. I like a good challenge, though. And I love transforming and organizing a space. 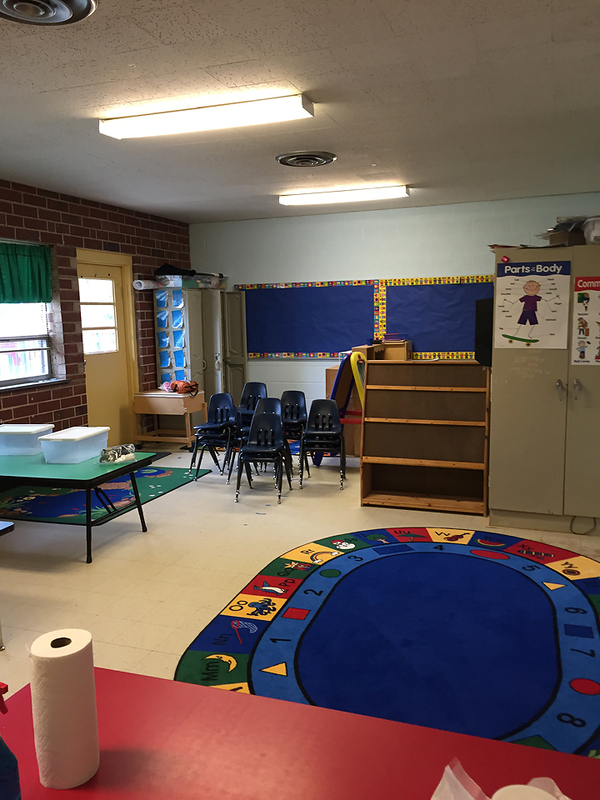 Here is an inside peek to before and after…. 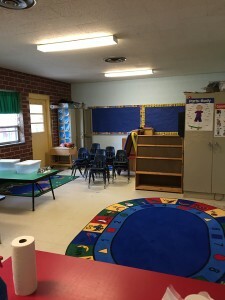 This is the classroom. A bit overstimulating. There was a lot of stuff everywhere. 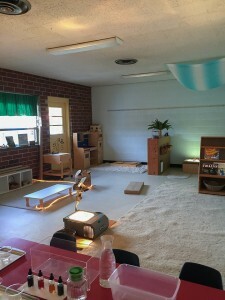 Here are the steps I use when transforming a space – whether it be a classroom or playroom…..
1. Move everything out. Yep, get to work and clear out the entire space. This includes taking everything off the walls. 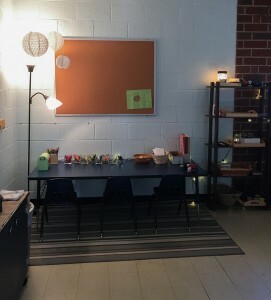 My classroom had SEVEN cork boards (not even at child height – which is an entirely different topic altogether) with SEVEN different colors and SEVEN different borders. Whoa!! 2. Clean. There’s no better palate than a nice, clean space. My classroom walls were covered in posters, letters, numbers, tape, and Velcro. The first thing I did was rip those suckers off the walls. I did that before I even decided to take ‘before’ pictures. My floors were a disaster, covered in tape and sand. 4. 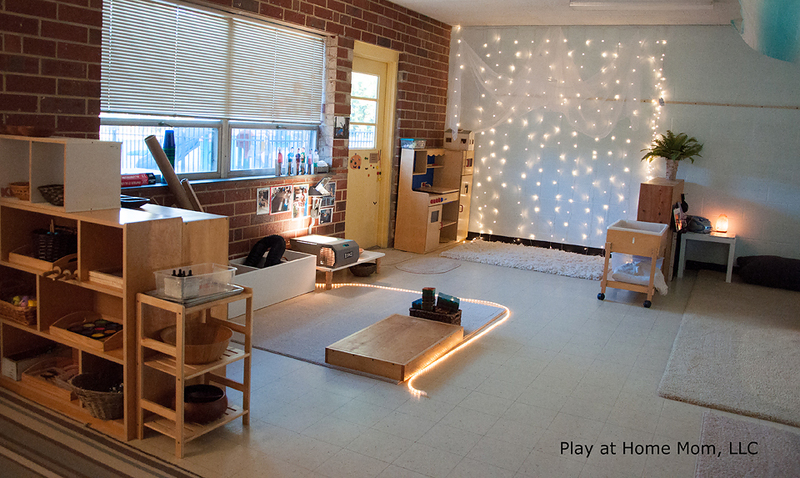 Sit in the space – I know this sounds corny, but sitting in a space to visualize how children play is important. 5. Consider the light. Natural light is a great area for an art space, darker areas are good spaces for relaxing and light panel play. 6. Is there a sink in the room? My classroom does not have a sink. Boooooooo! If you have a sink in your space, it’s also a good area for art….washing paint brushes, cleaning paint containers, etc. Clean walls and neutral rugs/tables helps keep the focus on the beauty of the materials in the room, rather than the bright colors of carpet, tables, and furniture. 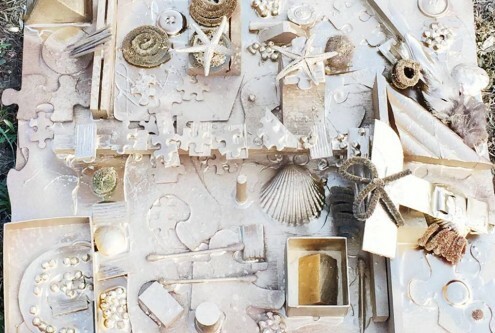 Let children create the space with pictures of them playing and their artwork. This is a great way for them to reflect on their play and feel worthy – the space belongs to them. 8. 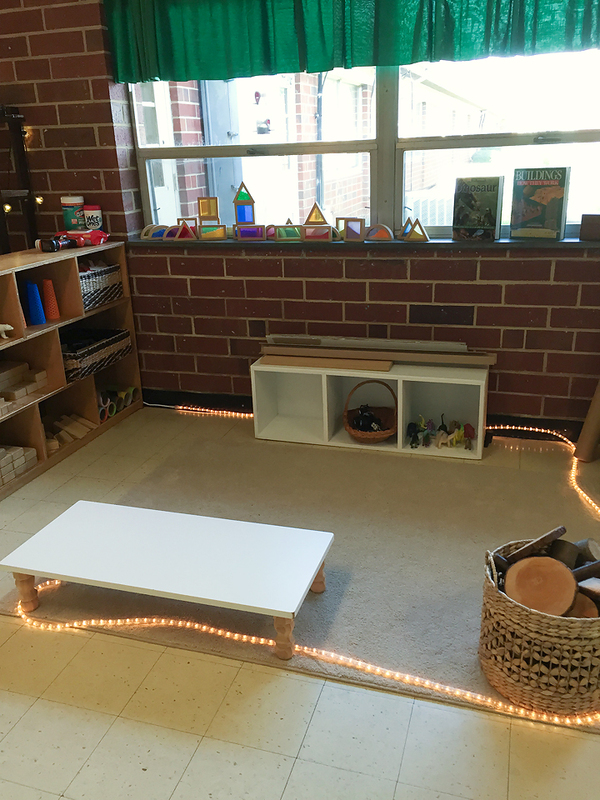 Move things back and set up one space at a time. You might find that once you get the furniture in, it really doesn’t work in that space. We have a resource room in our school, so ALL of the cabinets and filing cabinets from my room went in there, to allow for more space. 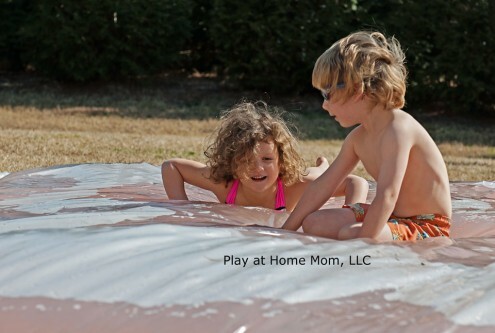 The same can be done with playroom closets, basements, and attic space. 9. Bring in your own lighting. 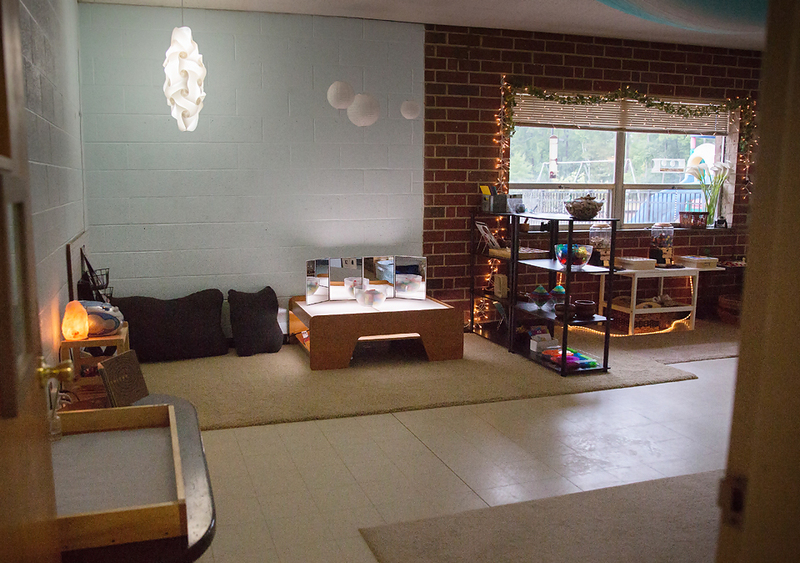 One thing I love about my son’s Montessori school is all of the natural sky lights and the fact that they use lamps around the room for lighting, as opposed to overhead fluorescent lights – yuk! I keep the lights off in my classroom and rely on light sources such as strands of light, rope lights, lamps, and the overhead projector to light our room. There is something very peaceful about the space, and everyone who enters my room comments about how peaceful it is. Yay! That’s what I was going for. 9. Remember that nothing is permanent. 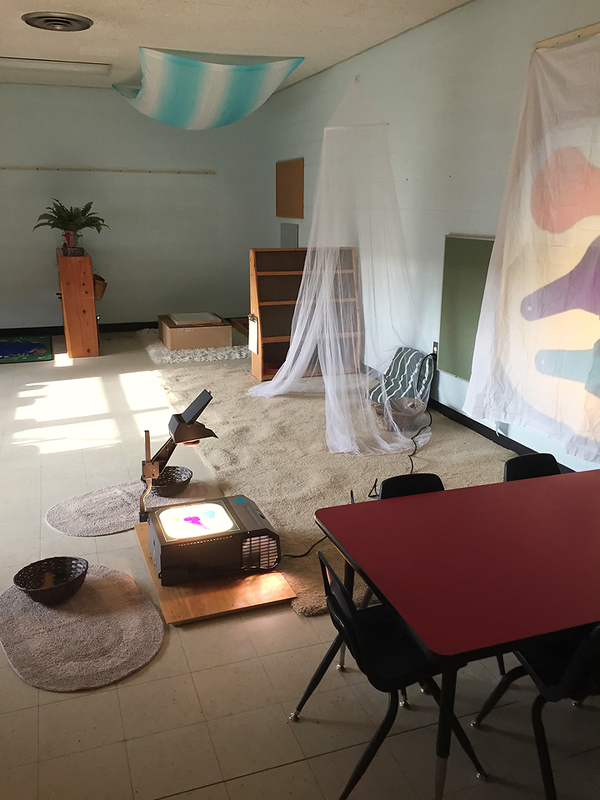 It’s okay to change the room around to meet the needs of your students. I recently made a “cozy corner” where we put our rock pillows. 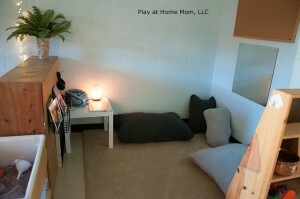 Children can go here to read, listen to stories, of just jump on the pillows. My guess is that my room will change again. HERE ARE THE BEFORE AND AFTER PICTURES OF MY ROOM….. I THOUGHT THE ROOM NEEDED A COZY CORNER. WE HAVE SOME PRETTY AMAZING ROCK PILLOWS THAT WERE SEWED FOR US, BOOKS, AND A CD PLAYER. The classroom continues to change. We make changes that meet the needs of our students, and utilize as much space as possible. This is the way it looks now…. Thank you for sharing! Really like your fb page and website. Very inspiring! 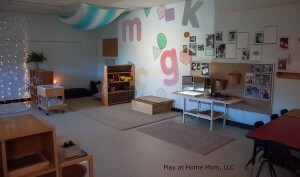 Just curious that why you choose Montessori school for your son instead of Reggio Emilia-inspired ones? I totally agree with you! 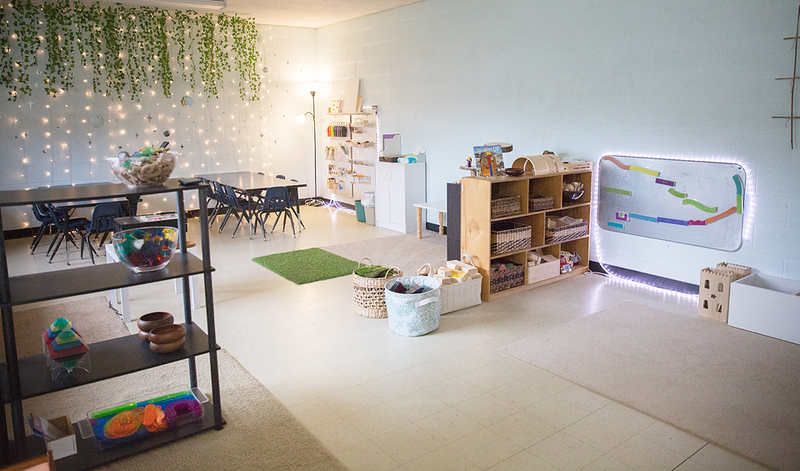 When I walk into most classrooms they are usually crowded, cluttered and overwhelming. I love your transformation. Where did you get the curtain of string lights? They give such a magical glow! 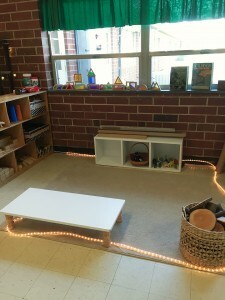 You have inspired me to go into my classroom today and see if there are ways to make it more peaceful. 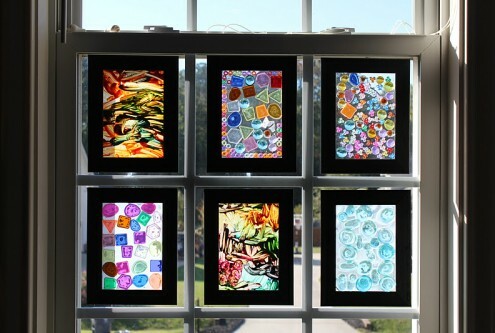 I teach preschool art and nature classes in my home. Love this! Are those just regular Chrissy lights or something different hanging on the wall? Thanks!